Specifically, if any string labeled more than 1 picture, all but 1 of those string-picture pairs (chosen at random) was moved into the UNSEEN set. As a result, the training data seen by participants in the second experiment consisted of a purely 1-to-1 mapping from strings to pictures, even if the language of the previous generation included 1-to-many mappings. By filtering out ambiguous meaning-strings, the authors are attempting to enforce an expressivity requirement: so that a unique 1-to-1 mapping between meanings and strings will add the additional challenge for a transmitted language to become structured. The goal being to see whether or not different pressures will result in markedly different solutions. As already mentioned, the results generally show languages become increasingly structured and increasingly learnable. However, the main difference between both experiments is in their expressivity: in experiment one, the languages that emerge have a high degree of ambiguity between the signal-meaning pairs, whilst experiment two manages to bypass this through the introduction of a filter. In a later paper, Cornish et al analyse these results under a new experimental methodology, which investigates this perceived tension between learnability and expressivity. 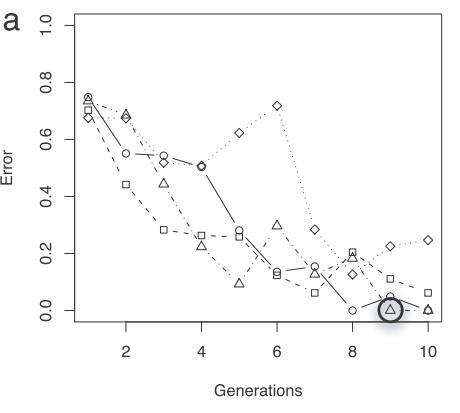 The major finding being the ability to discover the types of structure that emerged in two of their languages. First, they find one of the languages from the first experiment is clearly the result of underspecification: “[…] a reduction in the total number of distinct signals, introducing ambiguity with respect to the meanings”. Still, this ambiguity is not a random assignment of signals and meanings, but rather a system of consistently structured mappings emerged. The continuous coloured lines represent RegMap values obtained with all nine segment-meaning feature pairs in the ten generations of a language family from Kirby, Cornish and Smith 2008, referred to in Example 3. 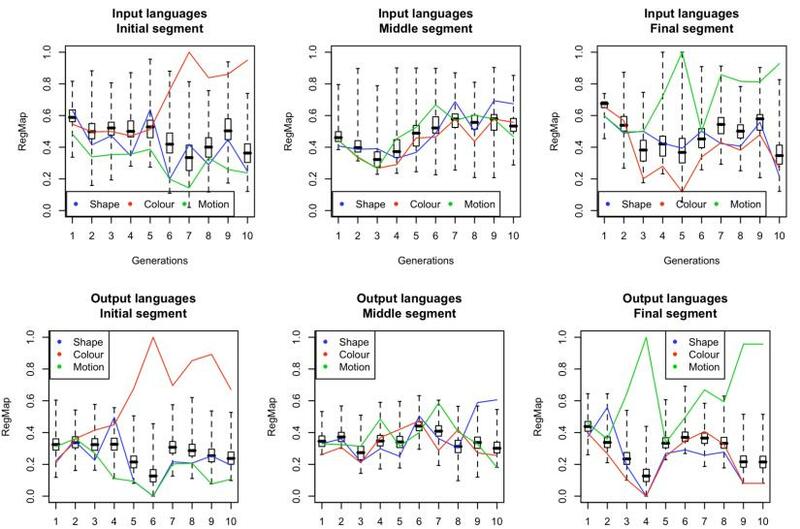 The boxplots show the distributions of values obtained with 10,000 randomised languages. The upper graphs show RegMap values from the sub-set of language (taken from the previous generation) that was actually transmitted to the current generation, after the ‘bottleneck’ was applied. 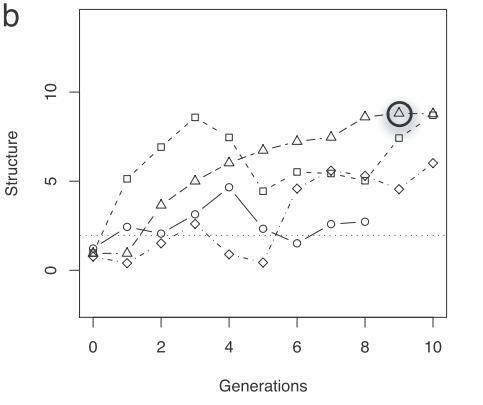 The lower graphs show RegMap values obtained from the complete languages that participants actually produced at a given generation, before the bottleneck was applied. Given only a bottleneck on transmission preventing a proportion of the language from being seen by the next generation, language can adapt in such a way that ensures it is stably transmitted to future generations regardless. This however occurs at the expense of being able to uniquely refer to every meaning. When they introduced the additional pressure of having to use a unique signal for each meaning, the language once again adapted to cope with these new transmission constraints, this time by becoming compositional. Having a compositional system ensures that both signals and meanings survive the bottleneck […] Moreover, we were able to more precisely describe the role of the bottleneck in bringing about compositionality: the smaller subsets sampled as inputs to the next generation may locally contain more systematicity than the entire language. 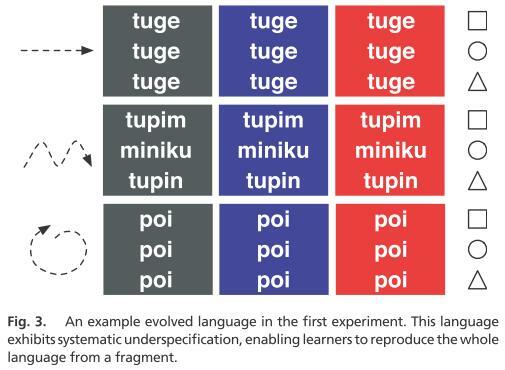 Iterating this learning process using these small samples therefore provides a platform that allows systematic patterns to be noticed, remembered and replicated preferentially, thereby allowing them to gradually accumulate in the language as a whole.